Practically nothing is known about Bellange’s life until his appointment in 1602 as a court painter to the Duke of Lorraine at Nancy, a position he occupied until his death in 1616. In Bellange’s time Lorraine was not a part of France but an autonomous (French-speaking) duchy, and its capital, Nancy, was the seat of a cultivated court and an artistic centre far richer in its achievements than Paris. In this environment Bellange rose to the position of premier artist of the court, carrying out a wide variety of official works, including painting portraits and decorative schemes for the ducal palace and providing large-scale ephemeral decorations for entertainments and festivities. Nothing of this work survives, however, and only a couple of oil paintings depicting religious subjects have been inconclusively attributed to him. He also appears to have been a prolific draughtsman but many of the drawings ascribed to his hand present similarly prickly problems of attribution. Bellange’s reputation today rests upon his etchings, which belong stylistically to the 16th century and represent the last, most astonishing flowering of the Mannerist style. While, on the one hand, Bellange’s wonderfully convoluted effects derive from the extreme forms of Netherlandish Mannerism, exemplified by Hendrick Goltzius, his linear vocabulary, on the other hand, comes out of the graphic language of Italian etching, typified by Federico Barocci. Yet this should not diminish our appreciation of the idiosyncrasy and brilliance of his artistry, which is all his own, and which marks the beginning of a native etching tradition in France. 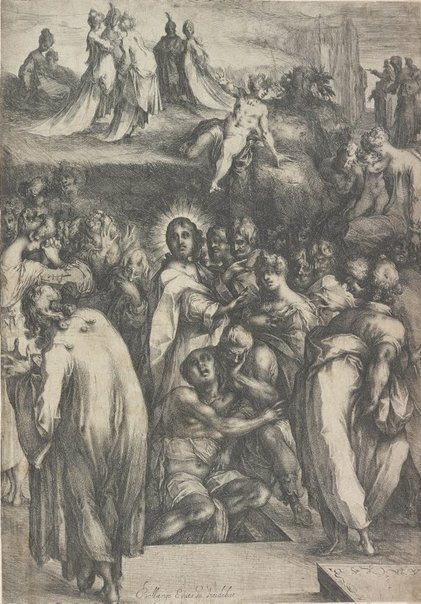 The corpus of Bellange’s prints amounts to 48 mainly religious etchings, completed over a period of a few years between 1610/11 and 1616. Bellange produced them as a private affair, independent of his official activities as a court artist and as a means of making a reputation far beyond the frontiers of Lorraine. Most of the plates are signed in an attractive script and several include the title Eques (knight) after his name. The raising of Lazarus is considered to be a late plate, possibly the artist’s last, on account of its technical refinement and the complexity of its large, sprawling, multi-figure composition. In the foreground two figures with their backs to us display gestures of the utmost contrivance (both have crossed feet and one even balances improbably on a single toe). They strain outwards like parting curtains, allowing us to behold the scene of Christ’s miraculous power in this ‘miracle of miracles’, as described in the Gospel of St John. Returned to life from the world of the dead, Lazarus emerges dazed from the tomb as his funerary bandages are removed. His sisters, Martha and Mary (usually present in visual depictions of this theme), are presumably the women flanking Christ, shown reacting with different emotions. Other bystanders look on with wonderment, covering their noses and averting their faces because of the odour. The prominent group on the right side of the middle ground resembles the Holy Family, but the significance of their inclusion here is enigmatic, not to say illogical (both cherished qualities in Bellange’s art). Behind the boy seated on the escarpment we see a party of attenuated figures in sweeping draperies; they look like ladies of the court engaged in refined conversation, oblivious to the momentous event taking place. Prints & drawings Europe 1500-1900 , Sydney, 2014, p 46, col illus p 47.